It is a modern, beautiful & versatile WordPress theme. It is designed for au pair company and nanny firm / babysitting agency, professional nurses services, nannies business bureau. Also it can be used for mom’s blog, forum and other children oriented websites like preschool organization, kindergarten, children corporate educational websites. On the other hand, the theme can be used for students and youth summer programs. 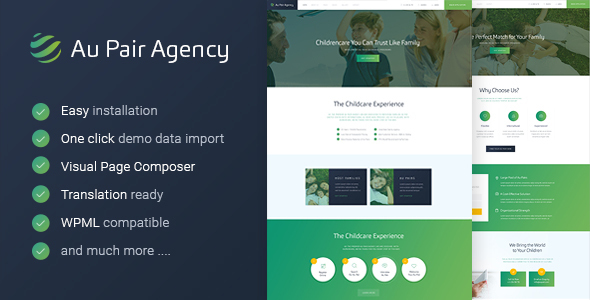 Au-Pair is made compatible with WPBakery (aka Visual Composer, which we think is better than Elementor), WPML, BuddyPress, bbPress, Revolution Slider and Contact Form 7. The theme uses lots of cool features to build an informative website. It’s 100% responsive and Retina ready so that your client can visit your site from any device. And it’s SEO optimized that help you rank your website on search engine.